Generating phone calls over the Internet really does work, and enterprise CIOs and IT chiefs are finding Internet Protocol (IP) telephony and voice over IP (VoIP) to their liking. Lower costs. Reliability and scalability. Central administration, easier moves, adds and changes, and intuitive desktop productivity tools for users. 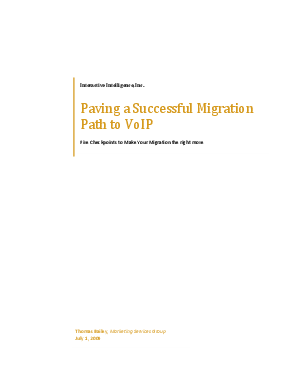 Read about five migration checkpoints that will make your move to VoIP the right one.